This homemade cream of mushroom soup is a great way to start a meal. Delicious and easy to make, it is also healthy and tasty. 1. Heat butter in a large, deep pan over medium flame. 2. Add the mushrooms and salt. 3. Stir well and cook until the mushrooms turn golden brown. 4. Add the onions and cook for a minute or two. 5. Add the garlic and cook for a minute more. 6. Add the corn flour and stir well. 7. Pour the stock, thyme and stir. 8. Simmer until the soup starts to bubble and reduce flame to low. 9. Cook for 30 to 60 minutes. 10. Transfer to a blender or using a hand blender, puree the soup until smooth or slightly coarse, in batches. 11. Add the cream and stir. 12. Simmer for a few minutes and adjust salt and pepper. 13. Pour into serving bowls, garnish with coriander leaves and serve at once. 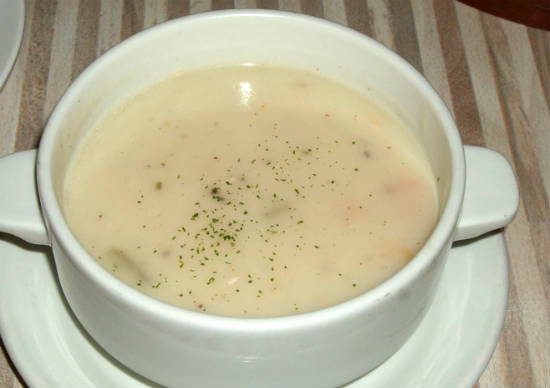 Feel free to comment or share your thoughts on this Cream of Mushroom Soup Recipe from Awesome Cuisine.